Akagera National Park is one of the top destinations to visit in Rwanda commonly known for a wide range of wildlife primates. It covers 1,200km2 in eastern Rwanda, along with the Tanzanian border. It was founded in 1934 to protect animals and vegetation in three Ecoregions: Savannah, mountain, and swamp from hunting and poaching. This park was named as it is because of the Kagera River which flows along its eastern boundary feeding into several lakes the largest of which is Lake Ihema. The complex system of lakes and linking papyrus swamps makeup over a third of the park, and is the largest protected wetland in Eastern-Central Africa. How to reach Akagera National Park? This park is located in the North Eastern part of Rwanda along the Tanzania border and you can better reach it by road which is about 2-3 hours’ drive from Kigali to Akagera National Park and you can visit this park on escorted and guide tour or on self-drive option with the private rented 4×4 vehicles from some of Rwanda car rental agencies with offices in Kigali. 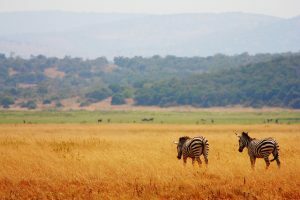 What to see in Akagera National Park? This wide protected area is commonly known for wildlife primates while in Rwanda and these include the African Big Fives like Elephants, Rhinoceros, Leopards, Lions and Buffaloes, different bird species. These African Big Fives named are clear residents of Akagera National Park as when it comes to the Rhinoceros it has both Black and White Rhinoceros which were introduced back after the Rwandan Civil War from South Africa, these animals were termed to be the Big fives because they were difficult to hunt by the game hunters and mostly very dangerous to human beings. Similarly in July 2015, 7 lions from South Africa were introduced and released in the park, making them the first lions in Rwanda for 15 years, And Beyond donated five lionesses from Phinda Private Game Reserve and Tembe Elephant Reserve in KwaZulu-Natal donated two male lions in an effort that was described by African Parks as “a ground-breaking conservation effort for both the park and the country” as part of a project aimed at reversing the local extinction of the species in Akagera National Park. Since most areas of Akagera National Park are dominated by swamps it makes it be a good habitat for different Bird species with over 525 Species recorded sightable in the park. Some of the species include 44 species of raptor, Papyrus Gonolek, Shoe bill Stork, a good number of Palearctic migrants, amongst which Lesser Kestrel, Great Snipe, and Black-winged have been recorded. Some of the Zambezian species include Sauza’s Shrike, Arnot’s Chat, and Long-tailed Cisticola. One species of Guinea – Congo Forests species, seven of the Afro tropical Highlands species and nine of the eleven species of the Lake Victoria Basin are also recorded. The best and prominent way of sighting these wildlife primates and different bird species in Akagera National Park is by doing a game drive around the park which costs you only $20 USD for the park ranger to lead you through the trails plus the park entrance which goes $40 USD per person per 24 hours.